Autophagy ("self cannibalism") is a process of cellular self digestion where a cell can digest portions of its cytoplasm, proteins, or even whole organelles to provide energy or cellular building blocks to allow the cell to survive times of stress. Importantly, we recently identified that pancreatic cancers have constitutively activated basal autophagy which they rely on for continued proliferation through its importance in the metabolism of these tumors (Yang et al., G&D 2011). This work has provided fundamental insights into the importance of autophagy in Ras-driven cancers and quickly motivated the opening of multiple clinical trials in pancreatic cancer at the Dana Farber Harvard Cancer Center and elsewhere using hyrdroxychloroquine as an autophagy inhibitor. Current efforts are underway to understand the role autophagy in pancreatic cancer metabolism and to identify critical biomarkers of response to anti-autophagy therapies. We have also shown that autophagy allows pancreatic cancers to proliferate in the setting of DNA damage and therefore it may play a role in the intense therapeutic resistance of these tumors. To investigate these critical questions, we are using a combination of in vitro and in vivo approaches using sophisticated mouse models of the disease. We are also taking biochemical approaches to identify cargo in pancreatic cancer autophagosomes and to better understand its intersection with cellular metabolism. In collaboration with the Harper Lab (HMS) we recently purified autophagosomes from pancreatic cancer cells and used quantitative proteomics to identify proteins that are associated with autophagosomes. Through a series of bioinformatics analyses we identified a high confidence list of proteins that includes both proteins known to be involved with autophagy as well as novel proteins. 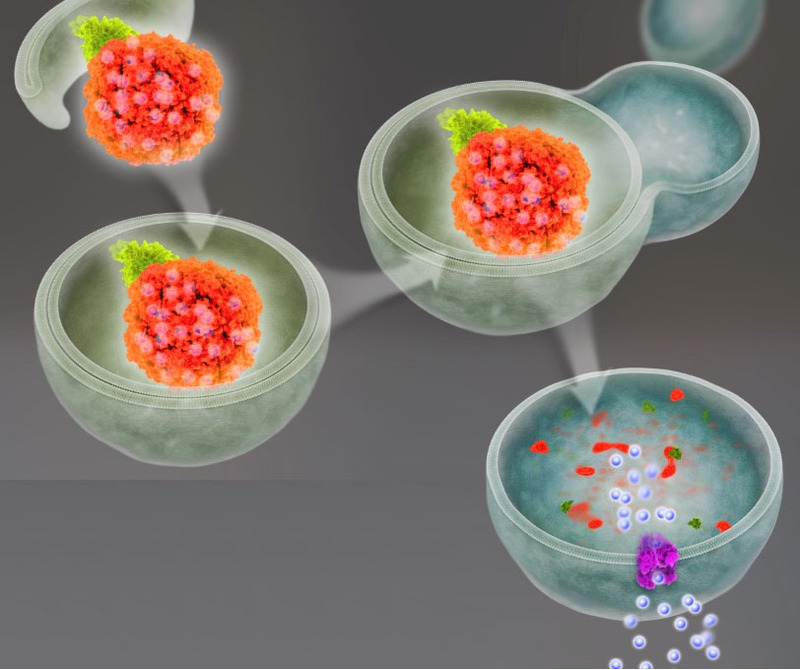 Current efforts are underway to explore the functional role of these proteins in the process of autophagy as well as in the biology of normal as well as pathological states such as cancer. This work also identified NCOA4 as the autophagy receptor for ferritin that targets this iron containing complex for degradation via autophagy (Mancias et al., Nature 2014). Thus, autophagy can control bioavailable iron levels through this process which we call ferritinophagy. We are currently working on further understanding the mechanisms of regulation of this process as well as its biological role in pancreatic cancer and in normal tissues. Using novel mouse models of pancreatic cancer where the Kras oncogene can be turned on and off, we were able to demonstrate that pancreatic tumors require the continued expression of oncogenic Kras for growth. Importantly, we identified that Kras has a critical role in re-wiring anabolic glucose metabolism (Ying et al., Cell 2012). In particular, it controls the rate limiting enzymes of the hexosamine biosynthesis pathway (HBP) and the non-oxidative arm of the pentose phosphate pathway (PPP). These are critical for protein glycosylation and nucleotide biosynthesis repectively. Furthermore, inhibition of the rate limiting enzymes of the HBP and the non-oxidative PPP lead to tumor regression. Our recent work has also demonstrated that pancreatic cancers utilize Glutamine via a novel pathway that is crtiiical for redox balance (Son et al, Nature 2013). Current efforts are underway in the lab to understand how these tumors use glucose and glutamine for anabolic metabolism utilizing a combination of metabolic labeling experiments and CRISPR/RNAi approaches. This will allow us to determine the critical pathways that are required for tumor growth. We have recently demonstrated a novel metabolic cross-talk between pancreatic cancer cells and pancreatic stellate cells (Sousa et al., Nature 2016). Stellate cells can promote increased mitochondrial metabolism in pancreatic tumor cells. Through a series of experiments, we identified that this is due to the stellate cells secreting the amino acid alanine. Interestingly, tumor cells can signal to the stellate cells to increase autophagy. This promotes the degradation of protein, leading to the secretion of amino acids, in particular alanine. We demonstrate that the tumor cells take up alanine and use it to fuel the TCA cycle. This additional fuel source allows traditional fuel sources such as glucose to be used for other biosynthetic reactions such as to make nucleotides. Autophagy inhibition in the stellate cells themselves can disrupt this metabolic cross-talk and impair the growth promoting effects of stellate cells. Ongoing work in the lab is exploring the critical metabolic contribution of alanine to pancreatic cancer metabolism. Additionally, we are looking at possible metabolic cross-talk with other components of the microenvironment. Lastly, this work highlights that in addition to the important role of autophagy in the tumor cells themselves, there is a critical role of autophagy in the stroma. This is actively being explored.